Vampires live a long time, and have time to develop many social graces, including dance. Duelists who have spent extended amounts of time fighting, and dancing see similarities between the two, and combine them into a devastating and accurate form of fighting that cuts through defenses. Special Notes: This unit’s skill at skirmishing allows it to ignore enemies’ zones of control and thus move unhindered around them. This unit’s marksmanship gives it a high chance of hitting targeted enemies, but only on the attack. Vampires are immune to drain and plague but are still susceptible to poison. During battle, this unit can drain life from victims to renew its own health. 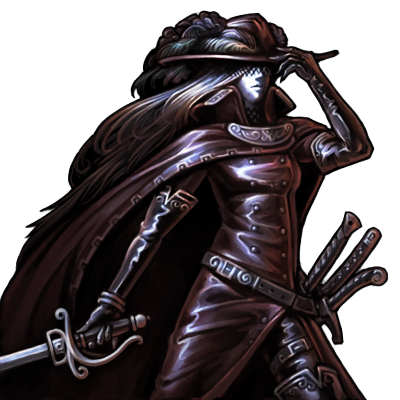 If there is an enemy of the target on the opposite side of the target while attacking it, this unit may backstab, inflicting double damage by creeping around behind that enemy. While defending, this unit's counter attacks will always have at least 60% chance to hit.